Defences were on top at Copley yesterday as Rishworthians despatched Yorkshire Two new boys Old Grovians 18-12, the visitors snatching a losing bonus point with the last act of the game. The visitors from Bradford came with a big reputation, but it was all Rishworthians for the first 25 minutes. 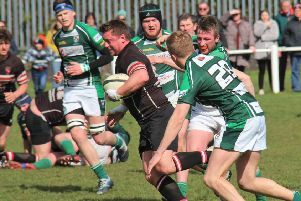 They took a 12 point lead, thanks to two tries and a conversion from Aaron Canning, which allowed him to break the club’s accumulative points record. Canning had originally been on the bench after a two-year spell plagued by injury but was brought into the starting line-up because winger Anthony Shoesmith had not recovered from an injury sustained at Castleford the previous week. Rishworthians were on top from the beginning, maintaining possession throughout. But they gave away penalty after penalties, otherwise they might have scored more points. Coach Chris Stone was pleased with the performance, particularly as Rishies were missing a number of regulars, but said they would have to work on improving discipline. It was two penalties given away by Grovians in quick succession, with scrum half Gary Morris breaking through from the first, which set up the position for the forwards to rumble over from lineout ball, No 8 Nick Faulkner getting the touchdown. Canning was unlucky when the ball bounced away from him after he had kicked through, then he and centre Jack Ledgard put in some good work. Rishworthians increased their lead with a classy try. After good work by the forwards with prop Ryan Mudd prominent, centre Kurt Sutcliffe linked with left wing Rhys Town who passed inside for supporting fullback Joe Billing to score wide out. Canning’s conversion gave him the record. Rishworthians could not make a further breakthrough but went into the second half leading 12–0. Flanker Harvey Keighley-Payne, outstanding throughout, started the second half with an excellent catch from a high kick. Rishworthians then had to defend, but their line speed was good and the visitors were unable to hit back. From a scrum, Faulkner, Morris and Canning linked well before replacement prop Phil Kershaw drove through to win a penalty and Canning added the three points. The visitors fought back strongly and maintained the pressure, but were unable to break through excellent tackling. Grovians did score from a lineout close to the home line. The home side looked to have held the drive before a Grovians forward suddenly broke away with the ball to score an unconverted try in the corner. Ledgard gathered a high clearance kick and put left wing Rhys Town away on a darting run. He was eventually stopped and the forwards took it on to win a penalty and Canning added a further three points. Town had another excellent sniping run, before Grovians fought back and scored a converted try at the death.